The intensive research and innovation activity pursued on production methods and processes has allowed the development of peculiar fibres marked by their eco-sustainability, colours and patterns joining modern trends, high level and long-lasting performances. 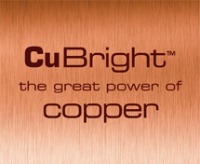 CuBright™, the innovative fibre containing copper microparticles for a natural antimicrobial action. Peculiar fibres whose shiny shades recall precious metals. Available in both abrasive and no scratch version. Through the use of natural components derived from renewable sources, eco-friendly fibres assure high cleaning performances. 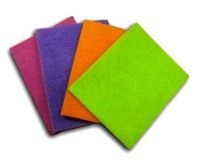 Abrasive and no scratch fibres characterized by their bright colours or blended with a variety of overlapping colours for an appealing visual impact. High-thickness fibre with high level and long-lasting performances for the cleaning of delicate and non-stick surfaces. 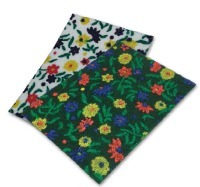 Fibre printed in multiple colours with high tenacity inks. 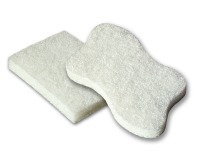 Available in both abrasive and no scratch version for delicate surfaces.